Bessie May Godsell Powers, 88, died January 15, 2019 in Tulsa, Oklahoma. The funeral will be at 10:30 am on Tuesday, January 22, 2019 at the Highland Park Methodist Church. Interment will be at the Mustang Cemetery in Mustang, Oklahoma. Strode Funeral and Cremation is in charge of the service. Bessie was born on February 19, 1930 in Stradford, Oklahoma to Richard Thomas and Esther Ethel Goodsell. 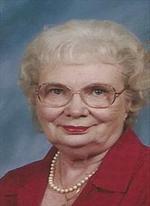 She graduated from Dill City High School in 1948 and then worked as a registrar clerk for Oklahoma State University. She married Samuel Ovis Powers on January 7, 1950 in Oklahoma City. Preceding her in death were her parents, husband, Samual Powers and daughter, Diane Powers. She is survived by daughters, Ladonna Winchell and Kerry Saladiner (Marc); grandchildren, Megan and Alex and great-grandchildren Jackson, Ethan, Ryan and Gabriel. To send flowers to the family of Bessie May Powers, please visit our Heartfelt Sympathies Store.